The Emory History Department takes pride in offering a small, distinguished program that puts the interests of students first. Doctoral candidates in History, working in close consultation with the faculty, define their specific fields of study, reflecting their own blendings of geographical, chronological, theoretical, topical, and comparative interests. Our more than 30 faculty members and approximately 60 graduate students—half on campus at any one time—provide a dynamic and supportive environment. Students work closely with internationally-known historians with proven experience in directing research, conveying teaching skills, and placing students in full-time positions. Their work is supported by superior library and archival collections and state of the art classroom facilities. Admission is highly competitive. We admit eight or more students each year. But once admitted, each student is awarded a fellowship which is renewable for five years, provided normal progress is maintained. This policy helps foster an atmosphere of cooperative learning, rather than competition for resources. Teaching and service responsibilities are light and geared specifically to teacher training. Students prepare three fields for the general examination. Field One may be defined chronologically and/or geographically. Field Two is defined in the same way and should complement Field One. Field Three is defined thematically, topically, or theoretically. 4 semesters of 3 courses per semester. (Those entering with a masters degree may only take 3 semesters and may have other requirements waived.) Courses are typically seminars that range from the required co-taught interdisciplinary HIST 583: Introduction to Advanced Historical Study, usually taken in a student's first semester, to more concentrated explorations of particular eras, regions, or topics. Some fields require a field historiography course. In addition, 2 separate follow-on courses ("P-sections") are required and devoted to preparing article-length as well as potentially publishable research papers based on primary research. The first P-section, the required HIST 584: Research Workshop in History, is normally taken in the second semester of the first year. The second P-section is usually taken as independent research directed by a particular faculty member. Otherwise students define their 3 fields and select courses that will help prepare for the general examination. Students can also schedule directed reading courses to explore topics not covered by the regular offerings. Students may take graduate courses in other departments when appropriate. 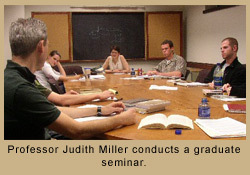 Graduate seminars meet once a week, generally in the afternoon, and rarely contain more than 10 students. They focus on reading and discussing the literature of a field, leaving research work for the P-sections. (For a student entering with a B.A. degree.) For further details, please read the PhD Requirements. Currently, all incoming students receive a stipend of at least $24,000, tuition scholarship, and a health insurance subsidy that covers 100% of the cost of Emory's student health insurance for five years, contingent upon satisfactory academic performance. In addition, the Laney Gradaute School supports outstanding applicants with three types of admissions fellowships. Professional Development Support funds are available and can be used for research, training, and conference attendance. Students are encouraged to concentrate on developing their research and professional skills through mutual interaction rather than competing with one another for funding. They also avoid the heavy teaching responsibilities common in many graduate programs. 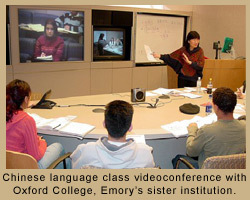 during their third or fourth year, students teach one undergraduate class following the completion of the general examination. These experiences allow the student to develop familiarity with the day-to-day work of being a historian. The Laney Graduate School's Teaching Assistant Training and Teaching Opportunity (TATTO) program ensures that each student’s education as a scholar is balanced with thoughtful and thorough preparation in the art of teaching. With the help of TATTO, Emory graduates enter professional life, whether or not that includes classroom teaching, with the skills of competent and confident educators. History students attend a short TATTO course at the beginning of their second year. Faculty for this course are drawn from among the best teachers across the University. The syllabus covers general topics of importance, including syllabus writing and grading, lecturing and leading discussions, the use of writing as a pedagogical tool, and the use of new technologies. Training continues in the second year through the Department of History's HIST 786A course and through assignment as a teaching assistant with a faculty member, to obtain hands-on experience within the history discipline. The program culminates in the student teaching his or her own class, with a faculty advisor as mentor. Students may have the oppportunity to teach a second course of their choosing at a later date, but this is dependent on certain circumstances. What is it like for graduate students to teach at Emory? Class sizes are usually capped at 40 students—a far cry from the larger courses common to other universities. Undergraduates of Emory College of Arts & Sciences are selectively recruited, and are bright and inquisitive. Computers also play an increasingly important role in teaching; many instructors use Blackboard to set up out-of-class discussions and offer direct access to texts and media materials. Instructors interested in interactive or multimedia presentations can request technology-enhanced classrooms. Instructors will find a wealth of support available, from the Emory Center for Interactive Teaching (ECIT), and at the Center for Teaching and Curriculum’s series of lunchtime seminars. In the seminars graduate students from all fields discuss teaching techniques and experiences. The Emory Library system consists of nine separate libraries containing more than 3.6 million volumes. 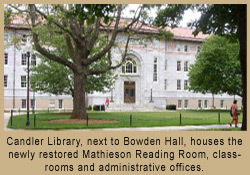 The Robert W. Woodruff Library, conveniently located next door to Bowden Hall, is the principal collection. Numerous computers are available for writing and research in databases like EBSCO, JSTOR, Lexis/Nexis, and ProQuest. Several group study spaces are available throughout the library, reserved study carrels are available in the stacks tower, and advanced graduate students can apply for office space in the library. Woodruff also houses Emory’s Center for Digital Scholarship, the Goizueta Business Library, and the Marian K. Heilbrun Music and Media Library. The Music and Media library features a large catalog of music, film, and video sources for research or classroom instruction. 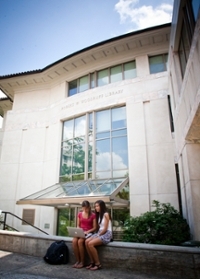 Emory University students have lending privileges at area libraries such as Georgia Tech and Georgia State University. Interlibrary loan gets books rapidly from the extensive collections of the University of Georgia and from anywhere in the world. 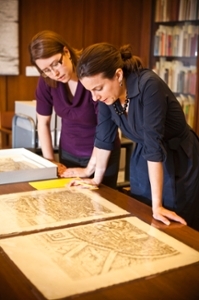 Membership in the Center for Research Libraries gives access to foreign dissertations, newspapers, and microfilm collections not held at major libraries. 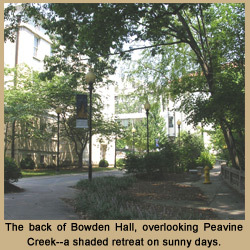 The Pitts Theology Library, the Hugh F. MacMillan Law Library, and Health Science Center Library, all in easy walking distance of Bowden Hall, are also resources for history students. The Woodruff Library has impressive collections in most of the areas covered by history doctoral programs. Full-time subject specialists work on collection development, large e-journal packages complement extensive print holdings, and automatic buying plans supply important new books in designated fields shortly after publication. Certain collections are particularly strong. In U.S. history the Keith Reid Civil War Collection contains one of the largest holdings of Confederate imprints in the world. Emory owns a virtually complete set of nearly every published primary-source collection of southern and African American history, including extensive holdings on Jews in the South. Students of European history will find outstanding collections in English, French, modern German, and modern Russian history. Woodruff houses a remarkable collection of early modern French local history materials, and an extensive collection of French archival inventories. It is also strong on the French Revolution/Napoleonic periods (including more than 3,000 Revolutionary period pamphlets). The African and Latin American history collections are also excellent, as is the growing catalog of South and East Asian Studies materials. 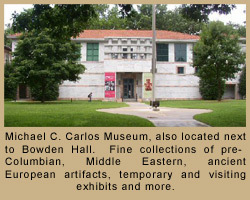 The Latin America collection focuses on Colonial, Argentine and Brazilian History, and includes the NACLA archive and the Princeton University Latin American Pamphlet Collection. Emory has extensive primary research holdings. The Manuscript, Archives and Rare Book Library, located on the top floor of the Woodruff Library, is a key access point for consultation. The collection is particularly strong in Irish and British literary manuscripts (e.g., Ted Hughes and Derek Mahon), African American history and culture, and well as the United States South, including Southern Methodism, the Civil War, Southern literature and journalism, Georgia politics and business, women's history, civil rights, American communism, and the Atlanta LGBT community. Recent additions include the papers of the Southern Christian Leadership Conference, the letters of Irish Nobel laureate Seamus Heaney, the papers of Pulitzer Prize winning novelist Alice Walker and Booker Prize winner Salmon Rushdie, and the J. Durelle Boles Collection of 17th and 18th century Southern imprints. The Pitts Theology Library built its collections upon the acquisition of the entire collection of the Hartford Theological Seminary. It also contains the Kessler Collection of Reformation Era documents (including the largest American collection of more than 800 documents by Luther) as well as sermons, hymnals, Methodist archival documents, and an extensive collection of sub-Saharan Africa periodicals. 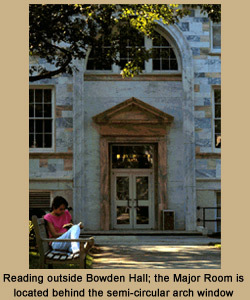 On most of Emory's campus both inside and outside of buildings, you can receive wireless access to Emory's network. 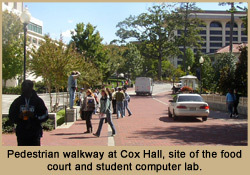 The Cox Hall Computing Lab and the Woodruff Library provide various computers stations with printing capabilities and in some cases, specialized software. For communication, graduates students have an official Emory email address and Emory Office365 email account. 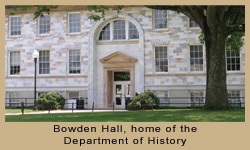 Bowden Hall has a dedicated computer lab restricted to use by history and philosophy graduate students as well as faculty. The lab provides both Mac and PC computer stations and printing is available. As a major research institution in a major southern city, Emory offers access to a wealth of interdisciplinary programs. 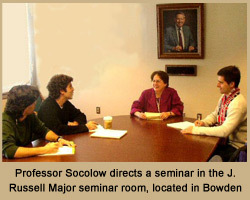 Many bring in noted lecturers and hold workshops and seminars. The Department of History organizes has several lecture series, and the Vann Seminar in Pre-Modern European History brings in experts to discuss scholarly papers in an informal setting. 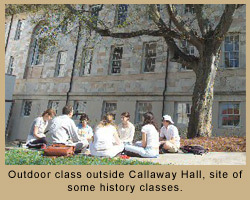 On-campus events are organized by the Center for Humanistic Inquiry, the Carter Center, the Center for Myth and Ritual in American Life, the Institute for Comparative and International Studies, the Center for the Study of Public Scholarship, Medieval Studies, Women's Studies, African Studies, African American Studies, Latin American Studies, Violence Studies, and many more. Students also have easy access to a number of major research repositories located in the Atlanta area. 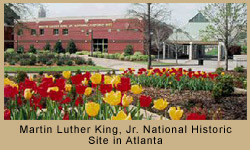 These include the southeastern branch of the National Archives, the Georgia Department of Archives and History, the Atlanta History Center, the Ida Pearle and Joseph Cuba Community Archives of the William Breman Jewish Heritage Museum, the Martin Luther King, Jr. Center for Nonviolent Social Change, and the Jimmy Carter Presidential Library. In recent years our graduates have had success at finding tenure-track positions despite the highly competitive job market. 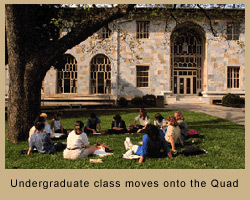 Students find positions in universities and colleges around the country, but Emory has especially strong historic ties with a wide variety of southern colleges. The core of the placement program is the Professionalization class taken by all students around their third year. It provides a hands-on introduction to the basic skills of being a professional, from constructing a Curriculum Vitae, to writing a proposal for a conference panel, and mock job interviews. The Emory Career Center offers a variety of services in identifying and pursuing jobs. 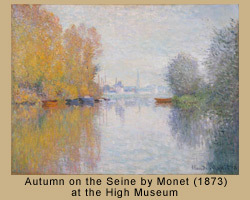 Students are eligible to apply for funding to present a paper at an academic conference—which allows students to “get their name out.” For students who are actively on the job market, the department generally subsidizes one trip to the American Historical Association Annual Meeting to enable them to pursue job interviews. 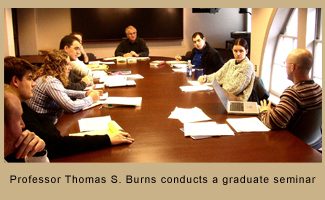 The Graduate History Society represents student interests before the department, provides a student representative on faculty search committees and maintains a library of useful monographs. It also sponsors parties, seminars on grant writing, on preparing for comprehensive exams, and SPOP! (Students Presenting Our Papers), a forum to present works in progress. The Graduate Student Council (GSC), represents all students in the Laney Graduate School, sponsors social mixers and offers discounted tickets to Atlanta cultural and sporting events. 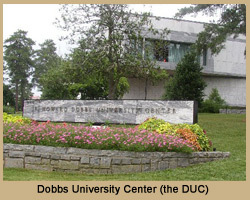 The Dobbs University Center (DUC) has a Dunkin Donuts, a Graduate Student Lounge, a Post Office, and the Emory Federal Credit Union. The Woodruff Physical Education Center (WoodPEC) offers exercise equipment; basketball, squash, tennis, volleyball courts; a rock climbing wall; and an olympic swimming pool. The Barnes & Noble in the Oxford Road Building, which is at the edge of campus adjacent to Emory Village, carries textbooks for undergraduate and graduate classes as well as trade books. 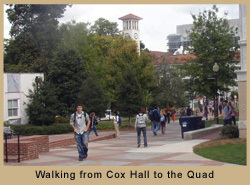 The Emory Village is also a popular student destination. Afternoons will find graduate students gathered at its restaurants and coffee shops. With a metropolitan population of more than 5 million people, Atlanta mixes Southern charm and corporate hype in about equal doses. A crossroads for international travel and business, host to the 1996 Centennial Olympic Games, Atlanta boasts more than fifty countries represented through consulates, trade offices, and chambers of commerce. With its major traffic congestion and record-long commuting times, the city sometimes seems like Los Angeles with hills. 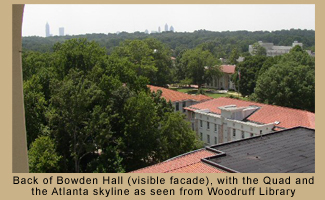 But inside the "perimeter" (and around Emory) are forests of pine trees, elegant residences and lively neighborhoods. The weather is mild for three seasons. Summers are hot and humid. Atlanta is distinctively multi-cultural. With a majority black population in the city proper, it is the residence of choice for many professional African Americans, as well as the home of Spelman and Morehouse Colleges and the Martin Luther King, Jr. Memorial. Atlanta has a long-established Jewish community and a growing immigrant population of Asians, Mexicans, Latinos, Haitians, and eastern Europeans. It is home to a large, active gay community. Neighboring Decatur has a small-town atmosphere with shops, restaurants and clubs around the courthouse square. Within a 20 minute drive or bus ride from campus are the urban nightlife of Buckhead, the bohemian atmosphere of Little Five Points, or the upscale galleries and restaurants of Virginia-Highlands. 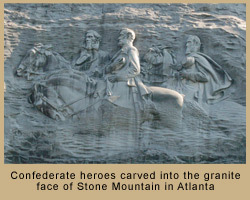 For tourists there are the Civil War battlefield at Kennesaw Mountain to visit, and the Confederate memorial carved on the side of the largest exposed granite rock in the world at Stone Mountain Park. For sports there are always the Braves, the Hawks, and the Falcons. Fans of the arts will appreciate the Atlanta Symphony Orchestra, the Atlanta Opera, the High Museum of Art, and a vibrant theater community. 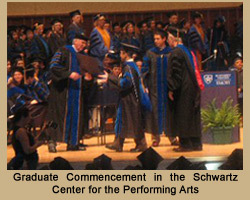 Emory also offers an ambitious concert series, film festivals, and good productions by Theatre Emory. Married students and their dependents are a common sight at Emory. Spouses and dependents are eligible to purchase passes to use the gym facilities. Lullwater Park and the main Quad are popular destinations for families with children for picnics, especially on weekends. Emory organizations sponsor numerous family-oriented events, such as the annual International Cultural Festival in the spring, the Carlos Museum’s popular “Tea with Mummy” Mother’s Day program, and the GSC’s discounted ticket sales to Braves games. Atlanta has active religious communities for almost every faith. Public schools in the Decatur area are among the best in the state. Graduate students with spouses will find in Atlanta a welcoming business environment. Numerous banking and international firms have offices here; the Atlanta Journal-Constitution’s AJC-Jobs.com is a handy reference. Prospective students with children can consult Brown Richards and Associates, kept on retainer by the University, about their specific child-care needs.